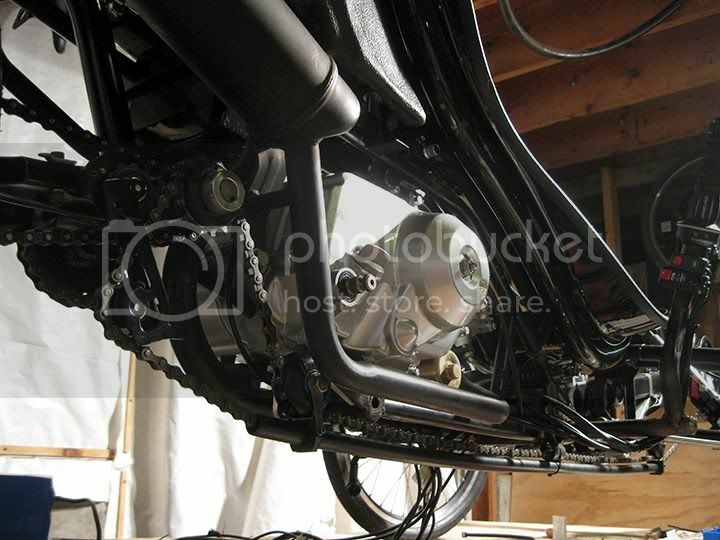 Belts are a nice option for a standard bicycle four stroke conversion tho, I'm sure you're familiar with Wizzers? Wow, that is some beautiful work. Amazing little machine! TBH, I do think tadpoles are a lil... odd looking save for the form following function aspect ofc *shrug* I've dabbled a bit with trying for a "pretty" motorized bike* & while I do like it, it's got about a 100 mile range maximum - or to be more accurate, I've got about a hundred miles I can put up with before I'm totally sore & exhausted, despite the sprung forks & seat and it's balloon tires. Any thoughts of building a streamlined shell a la the Quest velomobile? TBH, turning this thing into a full fledged velomobile is more than a lil bit of a challenge and I'm not sure about the consequences... everything is a compromise & one of the ones I had to make was it's overall length in order to motorize & suspend. I've been trying to keep it's wheelbase as close as possible to other "preformance" tadpole trikes - but I did hafta add roughly 10" to it's wheelbase to squeeze the motor in there w/the rear suspension's travel accounted for... and it all adds up. While that may not seem like much & it isn't particularly in height (gonna defo need the silly orange flag lol) - as soon as I start trying to match a body shell to it, it starts getting ridiculous, the width and very much the length start becoming relatively unmanageable, a minimum of ten feet long for example (pedal/feet clearance). Last edited by BarelyAWake; 08-16-2011 at 06:35 AM.. Mine was 9' long with the full fairing since I have a hub motor, and no frame extension, 40" wide, and 3' high with the roof on from 2005 t0 2010, then I took the top off then removed the shell in 2011. Amusing that you are thinking ahead (like I should have). I had to get in like a "pretzel" into a 4" off the ground floorboard into a 2' long open door. Couldn't see behind me with the top on (whale tail was also a headrest). What "ruined" it was speed. I went my top speed downhill; then aerodynamics and gravity took over. Climbed right out of safe control. Way too fast! When I stopped - I dismantled the trike the next day. Scared me! The rebuilt trike top speed is nowhere near what it was; but that is fine with me! I do not care for those orange flags, but that 2 tone 'Be Seen' flag is good enough! So your feedback is greatly appreciated - while I'm not building it for speed, I am trying for efficiency & it's interesting to note the two are often intertwined... I suspect this thing will be plenty fast 'nuff even w/o a body, but still, I'd love to see what kinda mileage I'd get w/one. The mueller fairing makes a pretty fair front if you attach coroplast sides. By itself you probably won't notice any difference. Your drive train makes a lot of turns. how much friction do you notice when you pedal backwards. I think it is a reasonable measure of drive line friction. Hope that you are using quality idler wheels. Mcmaster carr sells nice v belt pulleys with ball bearings that make great chain idlers. I agree, w/o the sides & tail I suspect a fairing would be mostly for comfort - which ofc I've no aversion to lol... yet seeing the above pic has brought another concern to my attention & one I'd not considered before (thanks BTW), & that's weather - most particularly side gusts. While the above body shell no doubt vastly reduces wind resistance under ideal conditions & it's hard to tell from the pic how tall it actually is - I can't help but wonder what effect it had on handling & control, say w/a variable 20mph crosswind for example... a phenomenon not uncommon at all on the coast of Maine (to be guilty of a grave understatement heh). While I think I'd have some advantage over the above (what appears to be) bicycle with the lateral stability a trike provides... I think perhaps I'd attempt a more "form fitting" body, reducing it's profile as much as possible.... which granted, my not be possible at all. Unfortunately yes, my pedal chain takes a somewhat convoluted route & worse yet it's redirects are on the power side. After many admittedly silly attempts to pass it through the A arm suspension (to try and increase ground clearance), I resorted to blatantly copying the chain path used on an unsuspended taddy. As I've that great honkin' engine case in the way - I've little choice. It's only a lil 49cc four stroke, but as it's an auto clutch (I've already too many levers and whatnot lol) it's somewhat wide (11"). I do appreciate the link to the V belt pulleys as it seems the second ya seek "recumbent" bits, the price triples regardless of how basic the part may be - strikingly similar to "marine" or "aviation" stuff it seems lol, I took another option however and one that's seemed to work really well. Despite the fact my "clicky" research informed me that I should use cogs on the power side (to reduce the felt vibration of links passing over a roller), I simply got some inexpensive skateboard wheels and lathed them down to accept the chain & replaced their shoddy bearings w/some quality sealed ones I happened to already have. I'm planning on getting some better skateboard wheels at some point, a softer compound (again, reduce felt vibration) yet at the time the cheapos were all I could find locally & as I'd never attempted to lathe skateboard wheels before - I figured these would be good enough for my experimentation. As it turns out it worked really well, with the teflon chain return tube, 'Starboard' (fancy overpriced plastic, same as a cutting board tho) chain retainers & tube supports and the new route - I can now pedal and back pedal freely w/o binding or undue friction... ofc there's some friction, but the pedals will free spin a couple of turns despite the chain being bone dry. I have ridden it fully faired on a lot of centuries, road races and track events. It does fine in the wind when running in the mid 20 mph range. The key to having a good handling road machine is to keep the the nose spherical and the body short. a mueller fairing would be the start of nice streamlined shape. Mueller will sell overblown fairings pretty cheap. Just build a mount and you are in business. When your skate wheels fail consider the pulleys. Don't worry about having the teeth.